“I have been using Auckland Mobile Mechanics for years and have worked on all our cars, our childrens cars and my mothers car. Thank you very much. I have found them to be very efficient at car repairs and car servicing, I would recommend this Mobile Mechanic service because they are excel at what they do”. I found Auckland Mobile Mechanics Rotary engine specialist services to be quite efficient and friendly, I just wanted to thank the team for the car repairs last week, my car is running better than before so thats great work! Thank you so much! Thanks for all your help with our Ford Fiesta! We have only been in Auckland for 3 weeks, and our car brokedown, we did not know where to go for our car repairs, and thankfully found Auckland Mobile Mechanics on the net, they were very professional and amazingly quick and efficient at what they do. I recommend their service to anyone who has broken down and needs help 24/7! They have always provided us with excellent service and workmanship. Thank you, highly recommened! Thanks for the fast and professional services, and free call out voucher! Job Well done, see you next time. Very Efficient and Reliable Service. I have been using the Auckland MM for over 10 years now and found them to be great reliable technicians with great customer services and positive attitude. We have been using Auckland MM for years and they have proven themselves to be the most caring mechanics I have used, because whe I have a car repair or car service need they are honest reliable and fast! Thanks for your car repairs, my Rx7 has never run so well! Thanks again always providing awesome service for our BMW x5, I know I can always call on Auckland MM for our car repair and car service See you next time, cheers! After we broke down in Bombay Hills last week, Auckland MM towed our car to their workshop, and repaired it for us, because the gearbox was broken, and needed a new one. The repair was quick and efficient, We were so delighted with service we now recommend them all our friends and family. See you next service! Thanks for the great range of services, they picked up our vehicle for a WOF and full service, did whatever repairs and delivered back to us! I didnt have to do anything, thank you Auckland MM, see you next time. Amazingly convenient car repairs and servicing, as they serviced and repaired my car at my workplace yesterday. Thank you for your help, much appreciated and will be using you guys again! Thank you to the team of Mechanics at Auckand MM for servicing and repairing all our cars. We have a fleet of 15 vehicles and all requires reqular servicing and or car repairs. They have been looking after our vehicles with great services and towing. When my car overheated 5 years ago, Auckland Mechanics were on the net, so I called them and they came to my workplace and repaired the problem. This was a very plesant experience, as I did not have to organise anything, appart from one phone call! I call them for my regular service and repairs, they are great and very helpful, most of all I could not believe how easy it is. Thanks for all your help! I would recommend the team at Auckland MM as they have always provided quality services and value. Thank you for servicing our car and WOF service, we enjoy using these Mechanics. Being a 214 hour 7 day service has been of great assistance for us. See you next service! Thank you for the Auto repair at our home on my Saab last month, awesome service and communication. Couldn’t have ask for better it clear they love what they do. They were recommended to me by my inlaws, as they also have a Saab, and also were happy with the help they received Auckland MM. 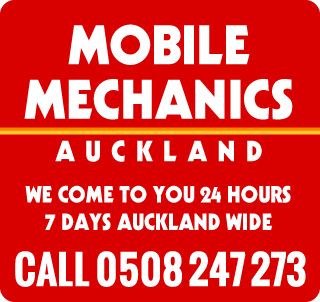 Auckland Mobile Mechanics always service and repair our car. We recommend them for any mechanical or electrical services, as they are fast and efficient.